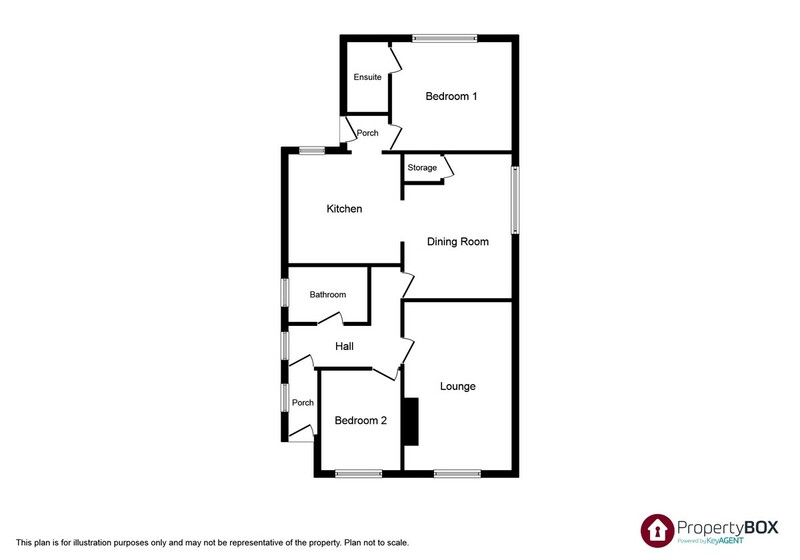 L-SHAPED HALLWAY With uPVC double glazed window to the side elevation, meter cupboard, double panelled radiator, laminate wood effect flooring, power points and loft access point. LOUNGE 16′ 6" x 10′ 10" (5.05m x 3.31m) With uPVC double glazed window to the front elevation enjoying views over roof tops towards open fields, double panelled radiator, wall mounted modern electric fire, coved ceiling and power points. REAR PORCH 4′ 0" x 3′ 4" (1.24m x 1.03m) With a uPVC and double glazed door giving access to the rear garden. BEDROOM ONE 10′ 8" x 10′ 7" (3.26m x 3.23m) With a uPVC double glazed window to the rear elevation, double panelled radiator and power points. ENSUITE 6′ 11" x 3′ 3" (2.11m x 1.01m) Having a three piece suite comprising low flush w.c., wash hand basin, purpose built shower cubicle, chrome heated towel rail, fully tiled walls and obscure uPVC double glazed window. BEDROOM TWO 9′ 10" x 7′ 10" (3.00m x 2.39m) With a uPVC double glazed window to the front elevation, double panelled radiator, dado rail, power points and laminate wood effect flooring. BATHROOM 7′ 9" x 5′ 5" (2.38m x 1.66m) Having a three piece suite in white comprising ‘P’ shaped bath with a ‘Triton’ shower over and splash screen, pedestal wash hand basin, low flush w.c., chrome heated towel rail, fully tiled walls and an obscure uPVC double glazed window to the side elevation. OUTSIDE The property is approached over a brick paved driveway providing off road parking and leads to a GARAGE with an up and over door, power and light installed, sink with base cupboards, plumbing for automatic washing machine, space for tumble dryer and personnel door to the rear garden. The gardens to the front are laid to lawn with shrubbery boarders and steps lead to the front entrance. A timber gate to the side of the property gives access to the rear garden which has a paved patio and steps with hand rail lead to a raised terraced garden having a decked seating area with a timber pergola, paved patio, lawn area with raised boarders with a variety of plants and shrubs and further decked seating area bounded by timber fencing. SERVICES Mains electric, gas and drainage are believed available or connected to the property with water by way of a meter. All services and appliances are not tested by the selling agent. DIRECTIONS From the Prestatyn Office turn left and proceed to the mini roundabout turn right and take the first left onto Fforddisa proceed along, turning left into The Meadows which leads round into St Chads Way, turn left and proceed to the far end of the cul-de-sac where the property can be seen on the right hand side.